Is Obama Backing off Nov.30 Deadline for Healthcare.gov Fix? 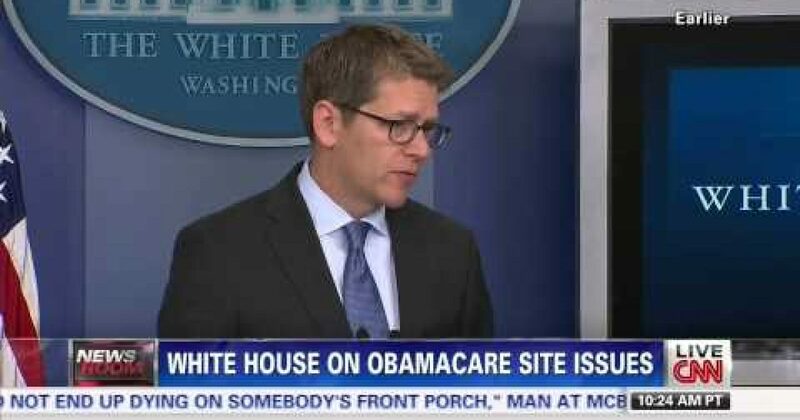 During today’s press briefing, Jay Carney seemed to inch away from the pledge that the Obamcare website will be fixed by the end of November. In response to a question from CNN’s Senior White House Correspondent Jim Acosta, Carney said the Healthcare.gov website may have problems even after the Obama administration’s November 30 deadline. He said experts believe the site’s performance will improve by the end of the month, but “that has never meant there would be zero problems with the site.” Carney edged back a bit more telling reporters the website will work for “a vast majority” of users by the White House’s self-imposed deadline. I wanted to ask you about the president’s comments last night in Dallas. He said we anticipate, use the word anticipate by November 30th, that the website will be able to work as it was supposed to. Just sounds like there’s a little bit of wiggle room there using the word anticipate. Can you say what the consequences would be for CMS, HHS people inside the white house if that website is not working the way it’s supposed to by November 30th? I can tell you that the objective here has not changed. Our position has not changed. It’s still that the website and its problems are being addressed by a team of experts and that that work is continuing around the clock every day and that by the end of the month we expect the site to be functioning at the standards necessary for the vast majority of the American people and that’s what we’ve said from the beginning. I wouldn’t read anything into that. Obviously challenging work except to say that this is because the problems are many and we’ve acknowledged that and the president’s made clear that that circumstance is unacceptable to him, which is why he’s demanded that all of the a taken that’s being taken. So, the work continues. Again, we expect the website to be functioning effectively for the vast majority of users by the end of the month. Sounds like a little wiggle room to me.